We like to pick a “theme” for our Thanksgiving menu. This year’s theme is Thanksgiving as an immigrant holiday, in the broadest terms. We hoping to have the menu to reflect the people around the table and where they’ve come from (this could be in terms of heritage, could be family memories or even recent experiences). We know who’s coming, we’ve got some suggestions from people for specific dishes, but now it’s getting time to get the recipes together in some physical or virtual location, start making grocery lists, and sort out how long it’s going to take to make everything and who’s doing what: the brass tacks of menu planning. I try to learn from previous years when it comes to menu planning. Of course there are a few guaranteed dishes: turkey, Grandma’s oatmeal bread, cranberry relish, mashed potatoes. But the sides vary a lot, sometimes within their own categories. 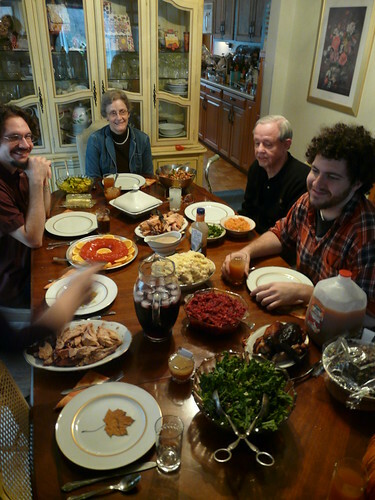 One year we had 3 kinds of stuffing, 3 kinds of cranberry sauce/relish/jelly, and at least two versions of sweet potatoes and butternut squash – just so we could have it as sweet or savory as anyone liked. Another year I spent a lot of time researching Native American and Early Colonial cuisines to try to incorporate as many authentic dishes as I could. I found a lot of great cookbooks using my librarian wiles (see my list & reviews) and had a lot of fun tracking down ingredients like acorn flour, buffalo meat, jerusalem artichokes, etc. 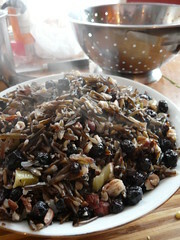 A few of those dishes have made it into our usual menu now (Indian Pudding, wild rice with blueberries). Other recipes were deemed too difficult to prepare or not tasty enough since we couldn’t get the right quality ingredients (native ingredients are tricky to find if they aren’t mass farmed). Last year my brother decided to take responsibility for the menu (which I did appreciate! ), resulting in fewer sides than I prefer (desserts were not an issue). I personally like to have a spread for Thanksgiving where you have to fight to get all the silverware in because it’s so packed with sides. I’ll leave it up to you whether that approach to this holiday is admirable or insane (I know where my family falls, hence last year’s restrictions). The moral of the story is, when planning a large meal, the basic steps are the same whether it’s an annual feast with everyone you can possibly drag in or a simpler meal with a few people. Answering the questions below will help you sort things out ahead of time so you can spend less time preparing and more time socializing. 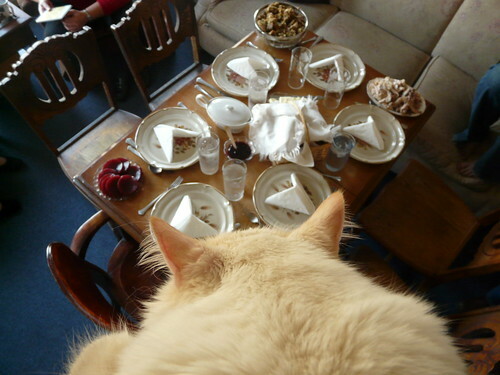 Because whatever you have on the table, the goal should always be to enjoy the people you are sharing your meal with. As I’ve dug up pictures of the food we served different years, I’ve also found pictures of the friends we spent the day with, going back to 2006, that I’ve posted below. They bring back many fond memories of friends that now are often far away from us, alas. But now I’m looking forward to more new friends and new memories at this year’s Thanksgiving. Recipes: There’s certainly nothing wrong with serving your favorite recipes regularly. I tend to find ways to fit certain things into many meals because they work so well when I have a lot of cooking to do and people always enjoy them. If you notice certain recipes are appealing, think about how you could separate out the prep work – if you can freeze things ahead, all the better! For trying new things, it definitely helps that my family likes to buy me cookbooks from around the world and I like to sit around reading them (especially if they come with pretty pictures). It makes it a lot less stressful to plan a big event if you already have some ideas for meals or recipes in the back of your mind you’ve been interested in doing. Try to find cookbooks that have really clear instructions if you’re doing a lot of new things. I like ones that show pictures of the techniques & interim steps, not just the final product – which is why I do the same thing here – the Hermes House books are pretty great for this. Also, as I mentioned before in “goals & limits,” finding cookbooks that use your leftover ingredients for other recipes makes a big difference in the value of the shopping you do for your feast. If you are interested in trying a cuisine and don’t know where to get started, I recommend checking if your local library has a collection of international cookbooks that you can scan through. Of course there are many great blogs and recipe websites, but check if they allow comments and how many commenters are saying they had trouble with the recipes. If you want to buy cookbooks, I would recommend LibraryThing for great recommendations. Food Contributions: Do your guests really want to cook, or are they asking for something they could do to make your day simpler? I usually ask friends to bring drinks or snacks if it’s a big meal that I’ve planned extensively, or something I would simply buy at the store so they don’t have to go to extra trouble. Salads and other simple sides are great if you have a complicated main dish in mind and not a lot of time, since people can make a personal favorite or pick something up easily. 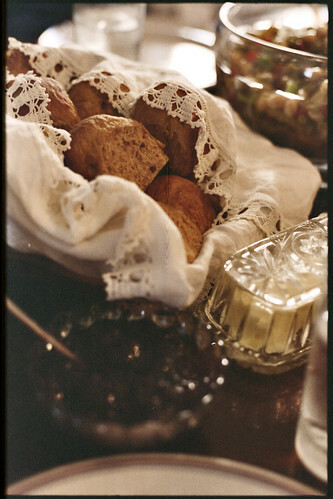 Formality: Casseroles and one-dish meals can simplify your life but also are messier to serve and not as pretty. How many courses do you want to serve? Do you need to keep everything hot? Seasonal Food: Including food from your garden, farmer’s market, or sales rack at a fruit market can keep costs down and bring out the best flavor. In fall and winter root vegetables or citrus fruits will be easily available. Some ideas of seasonality have more to do with nostalgia or our reactions to the temperature – soups vs. salads, of course, or holiday traditions. Checking online to see what is likely to be in season in your region can help prompt ideas as well. since you’re more likely to find recipes for things like pumpkin in the fall, obviously. Love a particular seasonal ingredient? Check to see if you can freeze or buy extra canned goods. We always get extra cranberries and freeze them, or cans of pumpkin. Our freezer right now also has bags of frozen cherry tomatoes from the end of summer and rhubarb from spring, both harvested from our own garden. Balance: This is about more than just the flavor or a proper nutritional pyramid. Aesthetics also come to bear: what are the colors and textures? We’ve had a few random weeknight dinners where everything just happened to be the exact same color. You don’t want that for a party. Thinking of nutrition also can help balance the meal, though – fruits and veggies or salads are helpful with heavier main dishes. Don’t let everything be starchy or people will walk away feeling stuffed. Reading about and cooking Korean recipes has helped me appreciate how much focus is put on balance in their cuisine, both aesthetically and in taste. They have five traditional flavors – salty, bitter, sour, spicy, and sweet – and some recipes can include many of these in one because the balance keeps any notes from becoming too overpowering. Desserts & Beverages: I haven’t had the time or context to really learn much about wine pairings. I will leave that to experts and people who have more members of their family and friends who drink and go on with my occasional after dinner cocktail with friends who do. A dessert course is an American tradition that often doesn’t quite fit into many international cuisines, where sweets may be more often eaten with coffee or tea between meals or later. 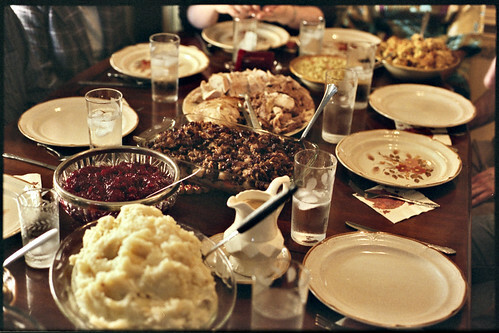 If you have a big enough feast, people may not have much room for desserts anyway. Pumpkin pie is required for us at Thanksgiving, even if we end up eating most of it for breakfast the next day. Indian Pudding has become a new favorite since it’s light and much less overwhelming than a lot of traditional seasonal dishes. If we leave time for games and relaxing, a dessert course much later is always welcome. and had heritage in Sudan, France, and India. 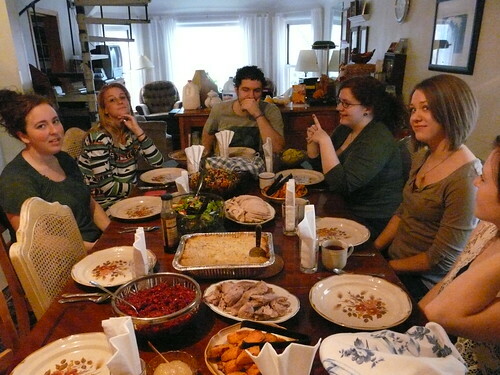 2008 – we had college friends, their families, our usual adoptees – enough people to spread into two tables and take over the couch. The cat staked out the 2nd table. A smaller table,since most of our previous friends were travelling away from our city, but we still found someone else to share it with us! 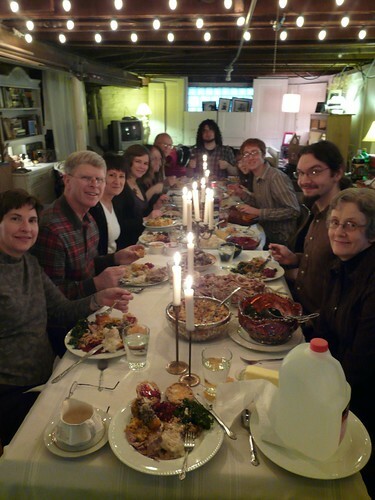 2011 – The year of the HUGE birthday party for my mother’s 60th (we cooked piles of casseroles ahead), which meant we actually had leftovers from that for our Thanksgiving table. We had all the traditional trimmings too, of course, and lots of college students over to eat them up with us. 2012 – No food in sight, but still one of my favorite pics (this is the aftermath of a big meal and a BORING movie). Our friends this year were from Virginia and Georgia, India and Scotland. One person gets two locations!